SNAP allocations built into President Barack Obama’s 2009 stimulus bill are coming to an end, leading to the cuts. Over the past few years, a bipartisan group of Democrats and Republicans have voted in favor of the cuts in exchange for increased education funding and school nutrition programs. At a protest Tuesday on Capitol Hill, a group of Democratic lawmakers who opposed the cuts to food stamps demanded that the funding be reinstated. "It was a piece of legislation that said let's change nutrition standards, let's get junk foods out of our schools, and let's make sure that our kids can have those fruits and vegetables," Connecticut Rep. Rosa DeLauro told the Huffington Post regarding the nutrition bill. "There was no money for it (the nutrition bill). The price of it was $2.2 billion. That came from the food stamp program and all of us here complained," the congresswoman said. "And we were opposed to that but we knew that it was a good first step in getting the Hunger-Free Kids Act." There appears to be little organized effort to prevent the cuts from going into effect, however, despite the political protest and the worries of charity leaders like Purvis. For some SNAP families living in the neighborhoods of New York City, the cuts may have direct consequences. But the plight of the hungry extends well beyond the city’s five boroughs. Programs such as SNAP create economic waves across their communities. In the case of food stamps, those consist primarily of the grocers who benefit when food stamp users shop in their stores. "This isn't just a New York issue," Purvis said. 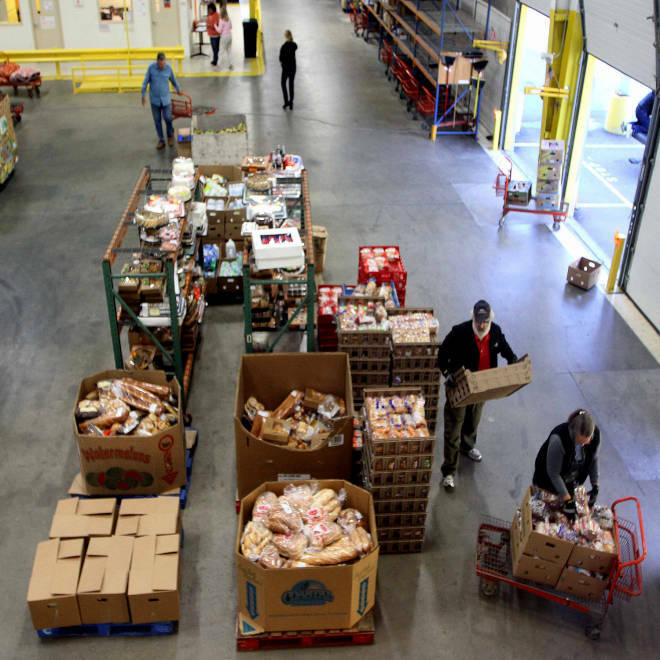 "In the world of hunger relief, food stamps are supposed to be the first line of defense." Amira Watson, a working single mother of four from Brooklyn, recently had to sign up for food stamps after her marriage ended and she lost one of the two jobs she was working after having to take maternity leave. Though she applied a few months ago, her approval won't take effect until Nov. 1 — the same day the cuts are slated to kick in. A medical assistant working nights at an assisted living facility for the disabled, Watson worries that the SNAP benefits won't be enough to feed her four kids, who range in age from three months to 15. "The job is good with medical benefits but not with the paycheck," she said. "I'm always in the hole with bills. If I pay the rent I'm sacrificing the light, if I pay the light bill I'm sacrificing the gas bill. It's always something." Watson said she finds herself relying on food pantries and other stopgaps against hunger while struggling to provide for her family. "Thank God for the food pantry and the Campaign Against Hunger," she said. "While I'm waiting for all this processing — glitches here and glitches there — thank God I could go there and shop for some food. I got some baby milk for my newborn, got rice, got a nice amount of stuff that will sustain us until something comes up." People on food stamps have become punching bags for politicians and pundits who tell tales of stamp recipients who use their allocation on beer and junk food and pile their shopping carts high. And yet, while the stock market soars to new heights and income disparity widens to Great Depression-era levels, SNAP participation has doubled over the past 10 years and increased nearly 25 percent over the past four. "Something has changed about America since the financial crisis, and the still-widespread popularity of the SNAP program is emblematic of that shift," Nick Colas, chief market strategist at ConvergEx, a New York-based brokerage and investment research firm, said in a report. "The American economic record, based on the food stamp data, is still pretty lousy." Colas said the economic hit from the food stamp cuts will be roughly $10 billion, with the numbers probably not telling the full story. "It may not matter to the economic data on which Wall Street hangs its fedora, but it is certainly enough to spark a political response," he said. "How this plays out, I honestly have no idea. We are in uncharted waters here, as the historical record clearly shows."